Since its inception in 2003, Grasshopper has aimed at satisfying the communications needs of business professionals, allowing users to choose plans that fit their needs and upgrade their plans as their business needs grow. 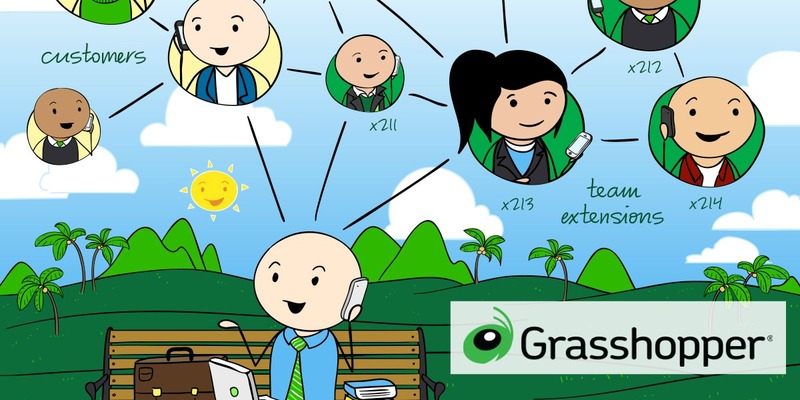 Grasshopper is not VoIP and was created to specifically meet the needs of small businesses looking to forward calls to other numbers – such as mobile phones or other land lines. Backed by the money and talent of Citrix, Grasshopper is a contender for business professionals in need of a high-quality phone service. An ideal phone service for those who travel or want to forward business calls to their cells while still keeping it professional. Who Is Grasshopper Best Suited For? Grasshopper offers three pricing options. Their base plan includes one toll/free local number, unlimited minutes and 3 extensions. This plan is aimed at small business owners and startups that have minimal needs, but still want to keep their company's image professional. From there, monthly service fees increase and a set number of extensions and phone numbers are included in the plan. Overall, users can expect to pay anywhere from $24 per month up to as much as $89 per month and receive unlimited minutes. All plans feature free activation. Each plan is designed to grow and add-on to the cheaper plan below. With each plan you also gain access to more features and free options – such as included SMS and voicemail transcription. Since there is no service contract, users are able to change plans as needed, or stop service entirely, without incurring additional fees. Grasshopper comes standard with a variety of call management features on all plans. These include call forwarding, call screening, voicemail, fax to email, voicemail to text, name directory, unlimited call handling, call routing extensions, and fax on demand. Some features that other providers could charge extra for, but Grasshopper offers free, include conference calling, hold music, name directories, and customized main greetings. A unique feature of Grasshopper is their ability to supply toll-free and virtual numbers – so business professionals that are frequently away from the office can still receive calls without giving out their personal mobile number – such as real estate agents, contractors, consultants, etc. This is also helpful if your business has telecommuting workers or traveling sales agents that need to give out a business number and keep their personal phone number private. Plans offer anywhere from one to three toll free or local numbers, with unlimited extensions. You can choose to keep your existing number (and port it to your Grasshopper account) or choose a new one. Vanity numbers are available as well at a one time activation fee of $30. Transferring a local number to Grasshopper will require users to first make sure there is no freeze on that local number. Any freezes will have to be worked out with the original carrier that assigned it. From there, users will follow the step-by-step guide for porting their number to Grasshopper, but users should note that the number may be unavailable for several days during the porting process and an alternate number may have to be used. This could be an inconvenience, but most companies that port numbers will have outages due to the transfers between carriers. 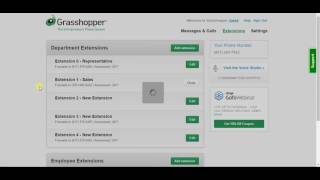 Most of the features offered by Grasshopper are included free and not necessarily “advanced”. They offer things like unlimited call handling – so you never miss a call – free conference calling, voicemail to email, etc. Call screening and the unique voice studio program from Grasshopper are also free and not necessarily anything advanced. That being said, it is refreshing to have so many features offered as part of the price rather than at an additional fee. But, we do hope to see more advanced features added in the future to help Grasshopper stand out from other cloud based phone systems. Grasshopper is extremely easy to setup. There is no equipment necessary with this cloud-based phone system, so businesses can avoid large upfront investments and the hassles of starting their service. Grasshopper's knowledge base makes it easy to get started as well with numerous step-by-step tutorials. Users can do everything from run their company with cellphones to send/receive calls from anywhere. Grasshopper offers 24/7 customer support. Customers can call their toll free number, search the knowledgebase or submit a question or request online. Accounts are managed online so that you can upgrade or deactivate your account without having to call the toll-free number. Also, Grasshopper does offer a 30-day money back guarantee. So, you can try the service risk-free. 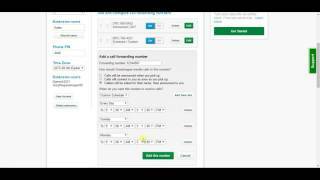 To cancel after the trial period, just submit a cancellation ticket online and Grasshopper will ensure the account is closed within one business day. We recommend submitting your ticket during the week and a few days prior to the end of your 30-day trial to avoid charges for the next month. 30 Day Money Back Guarantee. No Long Term Contracts. Our links give you a $75 Discount off any Plan. Grasshopper is best suited for small businesses looking to forward calls to another phone – such as a cell phone or other phone number. Because Grasshopper is not VoIP, but rather utilizes your existing phone service and simply reroutes calls to those existing numbers, there is no complex phone or system setup. If you are looking to replace an existing phone service that utilizes desk phones, then Grasshopper is not the solution for you. However if you are a busy office, that's always on the go and want to utilize existing mobile phones then we would recommend Grasshopper over any of the other providers we've reviewed. All Grasshopper plans now have unlimited minutes. You won't find yourself hitting a minute usage wall regardless of the number or employees you have on the plan. No Contract: Grasshopper’s monthly pricing is not dependent on an annual commitment for premium pricing. This means that the lowest priced $24 option is that price for all who choose it, regardless of service commitment. Users can upgrade, cancel or pause their service at any time within their monthly service period without penalties or the hassles of returning equipment. Risk Free Trial: We always appreciate it when a company offers a risk-free trial. 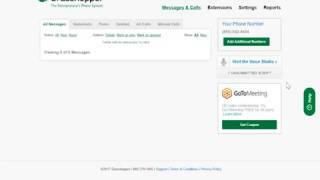 If you are shopping around for virtual phone systems, you can try Grasshopper for 30 days and still get your money back if you are dissatisfied. Cancelling within that 30-day period is easy too. You just submit a ticket through your account management portal and they will have it closed down within one business day. Do note this isn't a free trial, but a risk-free trial. That means you can try it for 30 days and enjoy a 30-day money back guarantee, but you are still paying upfront to use the service. Competitively Priced: Grasshoppers pricing plans are competitively priced for entrepreneurs and small businesses in need of cloud based phone solutions. Its entry level plan is especially attractive for those with limited resources and in need of professional services. Most importantly, there are no heavy activation fees or startup costs – so even large companies will not shoulder the burden of a huge upfront investment for special equipment. While traditionally Grasshopper has required a $25 activation fee, they have been waiving it via special promotions. Voice Studio: Voice Studio is unique to Grasshopper and allows businesses to use professional voice talents to enhance the customer experiences. You can even record greetings in different languages or record and produce quality commercials to use in lieu of hold music. While this feature is only included in the max pricing plan, it is available as an add on to any plan for a $75 monthly fee. Easy Setup: Most customer reviews point to the easy setup process as a major factor in their recommendation of Grasshopper to others. Since setup is almost instant, there are fewer barriers to those in need of professional services. 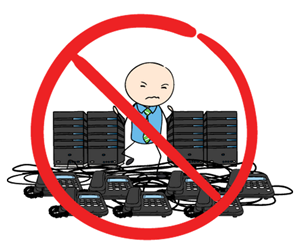 You don't have to be savvy with virtual phone systems either. Grasshopper's extensive step-by-step guides allow you to setup your service with ease. Professional Friendly: Grasshopper has one unique feature that other virtual phone systems don't. They allow business professionals to forward calls to their mobile phone. So, for those professionals rarely in the office (such as contractors, consultants or even real estate agents), they can still have a professional toll-free number, but have those calls directed to their cellphone. Also, professionals do not have to worry about giving out personal phone numbers to clients or vendors. Mobile Friendly: Grasshopper can be used with existing cloud based phone system equipment, as well as via smartphone. Users can access and manage their account on the go through a mobile app, available on Android and Apple devices. 24/7 Support: Despite their low entry price, Grasshopper does not restrict support to higher paying users. All users have access to 24/7 customer support online and on the phone. Call, submit a service request online, or search their online knowledgebase anytime—day or night. Limited Advanced Features: Grasshopper offers some great basic features, but lacks some of the bells and whistles offered by their competitors, such as caller analytics and custom ringtones. We do applaud them for offering so many great features standard, but to stand out and possibly meet the needs of a more established business, Grasshopper really needs to step up with advanced features. Companies seeking a fully-featured cloud based phone system may find Grasshopper too “basic” for their company. No Windows or Blackberry App: While Grasshopper works with existing devices and equipment and via mobile app on smartphones, its app is not available on Windows or Blackberry devices.